North Korea could consider testing a hydrogen bomb over the Pacific Ocean in retaliation to Donald Trump's threats to destroy the country, Pyongyang's Foreign Minister said Friday. In a tirade against Trump responding to the US president's thundering speech at the United Nations this week, the North's leader Kim Jong-Un warned of the "highest level of hard-line countermeasure in history". Kim, who stoked global alarm in September by testing what Pyongyang said was an H-bomb capable of being loaded onto a missile, did not detail what response he planned. But hours after the statement was published on Friday Foreign Minister Ri Yong-ho spoke to reporters in New York and raised the possibility of a further, more high-stakes nuclear test. "I think that it could be an H-bomb test of an unprecedented level perhaps over the Pacific," he said. But he added: "It is up to our leader so I do not know well." Tensions over North Korea's weapons programme have been ratcheting higher for months as Pyongyang launched a flurry of missiles and the nuclear blast. Trump has responded by driving a raft of new tough sanctions on Pyongyang and engaging in blistering rhetoric, culminating in Tuesday's UN address, where he said Washington would "totally destroy" North Korea if the US or its allies were threatened. In his response, Kim stressed that his threat to "tame the mentally deranged US dotard with fire" was "not a rhetorical expression". 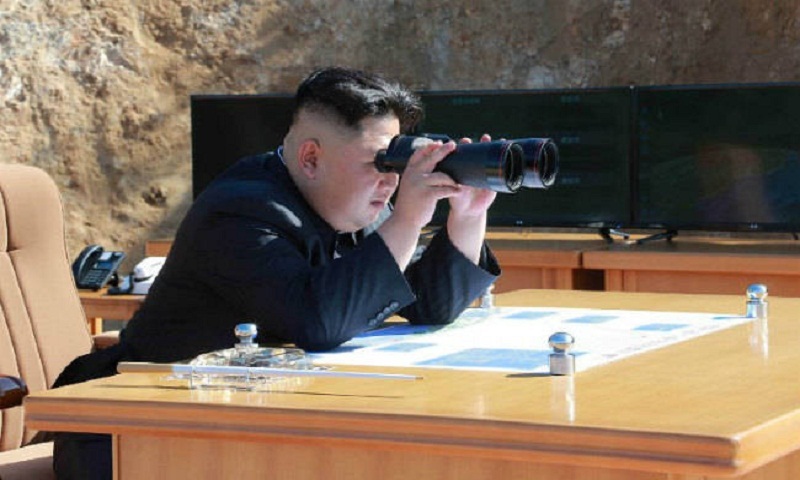 Chung Sung-Yoon, an analyst at the Korea Institute for National Unification, said there was a "very high possibility" that Kim would follow through with a provocation of some sort. Although it is far from clear what the North will do, Chung said it was possible the North could try to test an H-bomb over the northern Pacific. This would potentially trigger efforts by Washington to shoot down the rocket, he said, while China may take tougher measures to choke the regime, perhaps with an oil embargo that would be devastating for the impoverished country. Monitoring groups estimate that the nuclear test conducted in North Korea this month -- its sixth and largest -- had a yield of 250 kilotons, which is 16 times the size of the US bomb that destroyed Hiroshima in 1945. While the North has claimed to be able to miniaturise a nuclear bomb to attach it to a missile, there has been no definitive proof that they are capable of doing so. Following Trump's threat of "fire and fury" over Pyongyang's missile programme in August, the North said it was considering strikes near US strategic military installations in the Pacific territory of Guam. Kim later said he would hold off the planned missile strike, but would go ahead in the event of further "reckless actions" by Washington.